A remastered and expanded version of Borderlands, which includes both the basic version of this production and all add-ons. Moreover, the authors have enriched it with a number of improvements and improved its graphic design. 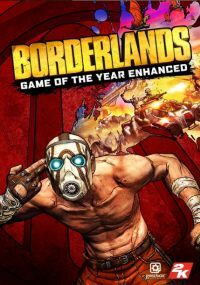 Borderlands: Game of the Year Edition is a remastered and expanded version of Borderlands, a 2009 release mixing the FPS and RPG elements. The title was created in cooperation between the authors of the original (Gearbox Software studio) and Blind Squirrel Games team. The creators enriched it with the content of all DLCs: The Zombie Island of Doctor Ned, Mad Moxxi's Underdome Riot, The Secret Armory of General Knoxx and Claptrap's New Robot Revolution) and a number of improvements that included the technical layer and gameplay mechanics. In Borderlands: Game of the Year Edition players hit the planet Pandora. The main characters are the Vault Hunters, who travel through this inhospitable world in search of a mythical crypt; the gates to it open once every two hundred years, and in the middle there are said to be countless riches waiting. Before you start playing Borderlands: Game of the Year Edition we have to choose one of the four characters. We are talking about Lilith (with supernormal abilities representing the Siren class), Brick (who is a Berserker), an excellent sniper named Mordecai (who is accompanied by a predatory bird - Bloodwing), and Roland (as a soldier he is the most universal character). During the game we observe the action from the first person perspective (FPP). The authors provide us with an extensive territory divided into a number of locations, where we can walk or drive the vehicle. Within them we carry out various tasks (we talk about both missions pushing the plot forward and side quests), as well as facing hordes of enemies. We eliminate the latter using a wide arsenal of firearms, and as we move forward, more and more powerful tools of murder come into our hands. In addition, we can use the special abilities of each hero; while Brick falls into a combat frenzy, Lilith can become invisible, Mordecai invades his winged companion's enemies, and Roland can set up an automatic turret shooting at enemies. In return for the activities we gain experience points, and after collecting the appropriate amount of them - we advance to the next levels, so that our combat potential gradually grows. While working on the Game of the Year Edition, the authors introduced a number of improvements. We are talking above all about a minimap based on the Borderlands 2, improved equipment screen and finally automation of the process of lifting ammunition and first-aid kits. In addition, six previously unavailable legendary weapons have been added to the game, and the player can change not only the colours of the outfit of the controlled character, but also her face. In Borderlands: Game of the Year Edition can be played alone or in a maximum of four-person cooperation, either over the Internet or (in the case of a console version) on a split screen. Borderlands: Game of the Year Edition has been refreshed; creators have improved their textures and surroundings. In addition, production runs at a maximum resolution of 4K and uses HDR technology (on platforms that allow it).